Form is great advantages for website owner or web designer to get their visitors register on their website, with the help of dreamwever 8 know it is easy for you to create forms using dreamweaver 8 in simple step by step procedure. Forms allow someone to visit your web page, enter data into fields you have predefined, then submit the data to you as an email message and/or as a file stored on your web site. To see an example of a form, visit http://www.smart/blackboard/forms/request_site.HtmL. 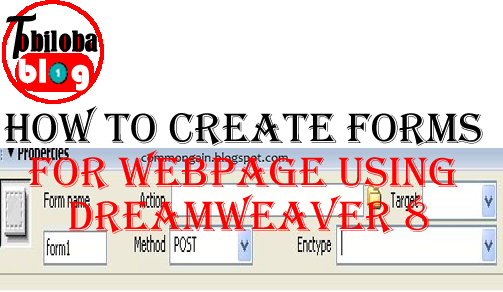 Dreamweaver allows you to create your form; however, before you can actually use your form you must obtain a key for each form you have created. A key is not required for this tutorial but you will need one when you actually create a form to be used on your web site. Keys may be obtained using the Submit Key Setup Tool at http://www.smart/tools/submit_setup.htm . Note: When you receive data from the server for a submit button of your form, it will be in alphabetical order by the name you give each form item in its properties. Therefore, it is very important that you name the fields of your form so that the data is returned to you in the order you prefer. For example, if you have named your fields Name, Street, and City under the field properties, the server will return the data in City, Name, Street order. Note: If using numerical values in your fields, be sure to name them considering the maximum numerical value that will be used. For example, if you have Field1, Field2, and Field11, the server will return them in Field1, Field11, Field2 order. However, if you have Field01, Field02, Field11, the server will return them in Field01, Field02, Field11 order.